Another Kind of Nerd: To Berlin! Last Sunday I hauled my cookies to Berlin. 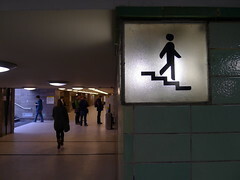 Ah, Berlin. Berlin is a place I've wanted to go for quite some time, but it always seemed so far away. So very far away. Considering some of the places I've been (Budapest, Prague, Bratislava), this was a very silly thought. I figured it out, though: Berlin is just close enough. You always feel like you could go there. It is in Germany, after all. But when you start to examine the ways and means, the nitty gritty, the brass tacks, it all falls apart. Too far away for a weekend and too too (if you know what I mean) for an American Tourist kamikaze trip. I did well, though, with Berlin. For sundry reasons I opted to rent a car for the treck. I mention this only because I was stopped by the polizei on the way out of town for a "spot check" and asked if I'd been drinking. At 7:45 in the morning. I attribute the stop more to the Fest going on that weekend in town than to a lack of driving skills. Better yet, it was as if the polizei was my first checkpoint into Berlin. Because I drove through Checkpoint Charlie, the Checkpoint Charlie, and everything had to be in order. Never mind that 20+ years have gone by. I turned a corner following my GPS instructions and there it was: guard house, giant picture of a soviet soldier, and tourists everywhere. Welcome to Berlin! 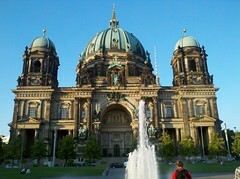 I stayed in the historical center of Berlin, Mitte, and walked everywhere. Literally. 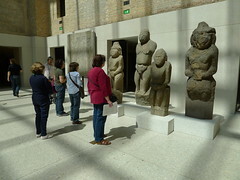 I took two walking tours on the same day because there was just so much to see and learn. And Mitte had it all: the middle ages, Frederick the Great, Humbolt University (Marx, Engels, Lenin! ), Cabaret, WWII, the Cold War, and reunification. This created quite the witches brew: bullet holes still riddled buildings from the Battle of Berlin; buildings returned to the Jewish Community waiting patiently for a new purpose; Soviet memorials to the Communists killed by Hitler next to unified German memorials; East German crosswalk signs (loved the ampellmann); and a community of people that embraced it all. I feel I should apologize for the lists, but I'm still trying to unpack it all. The excitement didn't end with Berlin! 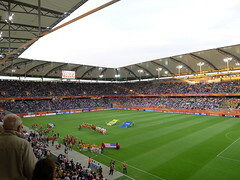 I made my way on Wednesday to Wolfsburg (home of the VW Bug) to watch the US play Sweden in the women's World Cup. The game itself was disappointing because we lost. There were missed opportunities, some panicking, and all the luck seemed to fall to the Swedes. But what fun was had. I sat alone in a sea of Swedes and Germans all rooting for Sweden. Alone I stood and cheered the amazing footsave in the first 10 minutes of the game by Hope Solo. Cheered the close calls, cheered the goal to pull it back within one, and applauded when the final whistle blew. That bit I wasn't alone. Those Swedes and Germans loved the outcome. That brings my tally of soccer matches up to two for the trip. Not bad at all. Sadly I returned to reality on Thursday. Back to work. But it's fine. My sister arrives in two weeks time. We'll do a small amount of hanging out in Germany, but then it's off to the Greek Isles for 10 days. I don't consider myself a warm weather traveller. I do not seek the sun. I run from shade tree to shade tree. But I've had so much rain and cold weather this trip I can't wait for the Mediterranean sun and heat.